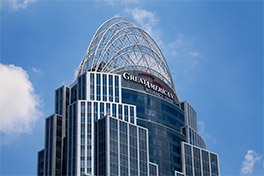 Based in Cincinnati, Ohio, our flagship company, Great American Insurance Company, was founded in 1872. As one of the largest Crop insurers in the country, Great American is recognized as a leader in this specialized marketplace. We're proud that we have been given the opportunity to give our expertise, our resources and our support to generations of America’s farmers. Great American and its affiliated property and casualty insurers of the Great American Insurance Group provide high quality, specialized commercial insurance products and services that protect business assets nationwide. The Great American pooled insurance companies are rated "A+" (Superior) by A. M. Best Company (as of March 20, 2015). Great American Insurance Group insurers are owned by American Financial Group, Inc., a publicly held company whose securities are traded on the New York Stock Exchange. Great American Insurance Group offers specialty insurance products and services tailored to fit the changing needs of today's businesses through our insurance divisions and affiliates. Links to these services can be found below. We are proud of our history and of our financial strength and invite you to learn more by visiting our corporate website, GreatAmericanInsurance.com.